Although space references in "Ant-Man" were ant-size — at one point, someone briefly rides an intercontinental ballistic missile — Marvel movies have always included hints of the space industry and a broader galactic scale. Marvel's newest movie may have only an ant-size relation to space, but overall, the Marvel Cinematic Universe's space-based plot points are quickly going galactic. 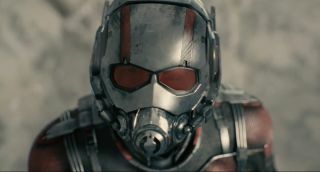 "Ant-Man," which opened in theaters last week, takes a relatively small scale: The former criminal Scott Lang, played by Paul Rudd, is drawn into service as a shrinking-and-growing superhero by Hank Pym (Michael Douglas), a scientist trying to stop the company he founded, and retired from, from releasing similar technology to the evildoers of the world. Lassoing rockets is only part of the job in "Ant-Man." But although "Ant-Man" stayed ground-level for the most part, other Marvel movies have shown a swiftly ascending focus on the vastness and strangeness of outer space. The MCU has been ramping up in scale, revealing ultrapowerful galaxy-level heroes and the villains to match them. But beyond those grand machinations, Marvel's movies have always had little cinematic winks to NASA and the space industry. Two other Marvel movies — "Iron Man" (2008) and "The Incredible Hulk" (2008) — stayed Earth-focused, but an appearance by Stark in Hulk's movie began to weave together the Marvel universe into a greater whole, including many alien entities. SpaceX CEO begs Tony Stark's attention for a moment in "Iron Man 2." The plot of the movie "Thor" (2011) centered around wormholes, "bridges" through space-time that are mathematically predicted by Einstein's theory of general relativity. Thor's home realm, Asgard, has instant access to numerous different spaces via wormholes (directed by their bridge of legend, the Bifrost), which scientists are studying. In "Captain America: The First Avenger" (2011), the film's villain — the Red Skull — uses what looks like a tricked-out V2 rocket as a getaway vehicle at one point as a nod to Nazi rocket research. And the plot involved the weaponization of the tesseract, which is a wormhole-creating device. NASA's Dark Energy Lab (as seen in "Marvel's The Avengers") doesn't actually exist, but the movie scenes were filmed in the Space Power Facility at NASA Glenn Research Center in Ohio. The start of "Marvel's The Avengers" (2012) is set at an intriguing "NASA Dark Energy Laboratory." While that laboratory is fictional, parts were filmed in Sandusky, Ohio, at NASA Glenn Research Center's Space Power Facility, which scientists normally use to simulate the environment in space. In the film, the fictional laboratory is researching the wormhole-creating tesseract, which suddenly activates and releases the villain Loki (and later, other unwelcome visitors). The Avengers emerge as humanity's defense against potential extraterrestrial threats. After all of the space action, "Iron Man 3" (2013) is a breather, as Tony Stark deals with earthly villains and his own psyche. "Thor: The Dark World" (2013) again deals with the science of wormholes, bringing far-off villains and cosmic powers to Earth, including a crazy alien ship. The boat Captain America and crew infiltrate in "Winter Soldier" is actually the satellite-launching ship Sea Launch Commander. The opening tableau of "Captain America: The Winter Soldier" (2014) is a mission on a sea-based satellite launch vehicle, actually filmed on the Sea Launch Odyssey launcher and Commander vessels (whose title is briefly visible, according to our managing editor). "Guardians of the Galaxy" (2014) — of course — is all about space: The hero, Star Lord, has his own spaceship (the Milano) and spends his time searching for pricey space antiques, ultimately saving the galaxy along the way. "Guardians" was Marvel's biggest step yet into a larger-scale galaxy tier of heroes, the superpowerful cast of characters who can go up against villains like Thanos (teased in final clips from other movies). We recommended "Avengers: Age of Ultron" (2015) as a space movie to watch out for in 2015 under the assumption that some kind of space-related content would make its way in, and we were not disappointed: Tony Stark's A.I. assistant Jarvis runs a satellite in low Earth orbit that pulls double-duty as a reconnaissance satellite for the Avengers and a Hulk monitor. The satellite is home to "Veronica," which includes Hulk-busting Iron Man armor that can be launched from space and rendezvous with Stark when needed. The film's baddie also offers a nod to the threat of asteroid impacts when he levitates an entire city and threatens to drop it on Earth to create an extinction-level event. All of this space-based world building (helped along by upcoming Thor and Captain America films, "Guardians of the Galaxy 2," and the television show "Marvel's Agents of S.H.I.E.L.D.") should pay off as the Avengers eventually square off against Thanos in the two-part Avengers: Infinity War in 2017. Ultimately, the MCU will be way too large to be confined to planet Earth.